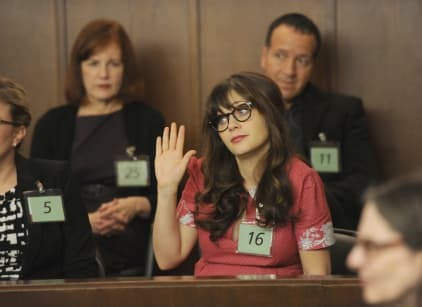 On New Girl Season 5 Episode 3, Jess is excited about going to jury duty, but is quickly turned off when she hears she's up for the acting principal position at her school. She calls up her friends for advice on how to get out of jury duty, but they don't come up with any good solutions. Jess tries to get out of it, but is surprised to see the man she met in the hallway is one of the lawyers on the case. Jess feels guilty and decides to go ahead and tough out jury duty. She soon finds out she'll be on the case for about a month and has to be sequestered from the public. Meanwhile, Nick is upset because Cece is making the loft messy and confronts her about it. The two start fighting, but Schmidt tries to reason with the both of them. Jess tells Cece she needs to just sign the loft contract to make Nick happy and move on with things. Cece agrees to sign the papers, but Nick tells her she doesn't have to. The both of them realize their fighting is stupid and they were actually jealous of each other because of their respective relationship with Schmidt. In the end, Jess goes away for a month, but leaves behind a bowl filled with advice for the roommates so they'll survive without her.